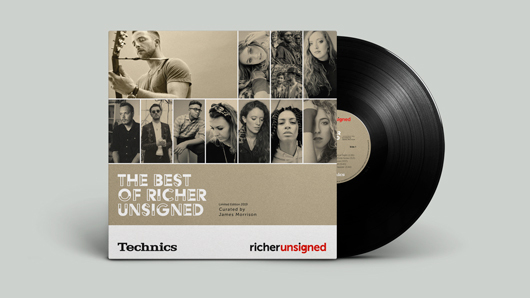 We excitedly announce this year’s Best of Richer Unsigned vinyl! This year, we’ve been lucky enough to have none other than James Morrison on curatorial duties, selecting 10 of his favourite Unsigned artists to have their songs lovingly pressed to limited-edition vinyl (2000 copies total) in support and celebration of vinyl retailers across the world on April 13th. At Richer Sounds, music has been our passion for more than 40 years, and Richer Unsigned are extremely proud to be able to offer upcoming artists this chance to get their music sounding it’s absolute best by being pressed to vinyl. If you want to add one of these exclusive records to your record collection, simply come and find us at our Record Store Day stall on Berwick Street, London on April 13th and grab a free goodie bag containing the vinyl along with a bunch of other exclusive freebies. In the meantime, have a listen to the featured songs and artists appearing on the vinyl and get yourself excited for the big day! And while you’re at it, be sure to check out James’ new album You’re Stronger Than You Know, out now at all your favourite places to buy music.